It is a modern world where the pace sets the competition and decides the future. It is the competition or the essence of luxury that today the world has got numerous not five but 7 star Hotels in the whole world. Before thinking of a 7 star Hotels in the world, it is important to know what the star rating system is. The star rating is used to denote the level of luxury and service. However there is no ranking system in the tourism and hospitality industry. There are various ranking system all over the world designed by different government, travel organisations and websites. We’ve grown up understanding that when it comes to stars the more is the merrier and the top star hotels in the world only prove us right. They not only reflect on luxury and class, but also boast elegantly of the exterior design and backdrops that make them look even more breathtaking. The 7 star hotels denote opulence and deliver outstanding experiences in hospitality. Here are some of the world’s finest and best 7 star Hotels in the world. Burj Al Arab in Dubai, UAE is the pearl of the ocean and the pride of Dubai. It is one of the finest and best 7 star Hotels in the world. This hotel is considered to be the fourth tallest in the world and stands on the manmade island 920 ft from the Jumeirah beach. The exterior part of the Hotel is in the shape of a sail and lavish ultra modern interiors make it drop dead gorgeous. This hotel is not just about its beauty it is about the hospitality and service to boasts. This hotel is connected by a private bridge to the mainland. The experience here are extraordinary right from an optional chauffeur driven Rolls-Royce to spending a day at leisure and from visiting the world’s best dining venues to taking a swim on the terrace. Pangu 7 star Hotels Beijing formerly known as Morgan Plaza is a luxury hotel in China. This hotel is located in the building complex of Pangu plaza and offers a spectacular view of the Beijing Olympic Park and many other Olympic venues. As we all know that dragon is the aspiration of Chinese, this hotel is also made in the shape of a Dragon. The only drawback of the employee is its English speaking capacity. But the friendly nature and dedicating service soon overcomes the drawback. The hotel is made up of a perfect combination of western and oriental architecture. Full Moon Hotel in Baku Azerbaijan is amazing, unique and superlative. This hotel introduces us to nature in its most luxurious form. Full Moon is 35 storey luxury hotels with about 382 luxury rooms and a parade on earth for those who dream to visit the moon. Full Moon Hotel in Baku offers a unique accommodation to stay at when in the city. No other hotels could beat the comfort and elegance here. The Flower of the East on Kish Island, Iran is the world’s second 7 star Hotels. The hotel is in the shape of the flower and is supposed to feature upscale Yatch harbour, residential complexes, hotels, marina, malls, condominiums and the golf clubs. The architecture is truly a Persian style. From the window of one’s lavish rooms, it’s also easier to witness and admire the sunrise. Signiel Seoul in South Korea: there is isn’t a single reason but multiple that make Signel Seoul the most luxurious 7 star hotel in Korea. Apart from its ultra comfortable and spacious rooms, its fine dining restaurant situated at 342 meters up in the air and refreshing pool and saunas add to the top notch exquisiteness of the hotel. Apart from this a stay here comes along with helicopter transfer, Michelin starred chefs and the largest champagne bar in Asia. Emirate Palace UAE is a seven star luxury hotel showcasing the Arabian culture with its architecture and design. The Emirate palace has great Excellency in luxury with 394 rooms and suites. It is surrounded by 85 acres of gardens and lawns. The 7 Star Hotels Galleria Milan is the only official 7 star hotels on this list. With only 20 rooms available it’s the most exclusive hotel on the list and you’ll be lucky to get a room. The hotel is seventh heaven for shopaholics. It drops you directly in gallera Vittorio Emmanuel II, Italy’s oldest and grandest shopping arcade. Laucala Island Resort in Fiji: Nestled amidst the serenity of nature, this resort offers a plethora to indulge in while you bask in the glory of ultimate hospitality, world class comfort and tranquil beach vibes. One may feel relaxed from the hassle and bustle of the city. Surrounded by nature all around this hotel serves some of the most delectable cuisines in the world with an outwardly touch of nature. Taj Falaknuma Palace, Hyderabad is labelled as the only 7 star hotels in India. The Taj Falaknuma Palace was built in 1884. The palace was built in the form of a scorpion with two stings spread out as wings and includes a walnut clad replica of the library at Windsor Castle. Now it is managed by Taj Hotel. It offers the guests the option of an arrival in a classic horse drawn carriage and a welcome of scattered rose petals. Marina Bay Singapore is an integrated resort. Marina Bay is the world’s second most expensive building. The facilities in the Marina Bay include a theatre, exhibition halls and entertainment venues. Marina Bay sand is built on a land of 15.5 hectares. A visit to this luxury seven star resort with an excellent view is a must. 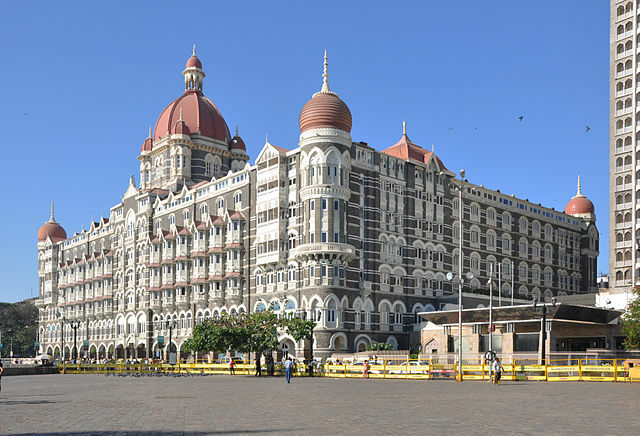 The Taj Mahal Palace Mumbai: This is the one of the oldest and most luxurious hotels in India and is the most favoured hotel amongst the tourists who visit Mumbai for holidays or business trips. When one visits Hotel Taj Mahal and amazing night view especially at night when the moon is bright can be experienced. It offers spacious and luxury rooms, night clubs, spa activities, swimming pools, restaurants and fitness clubs. Do visit these luxury hotels and experience the treatment given here.